Due to increasing temperatures ice of all ages declines. Since 1983, 5+ year old ice has declined sharply. 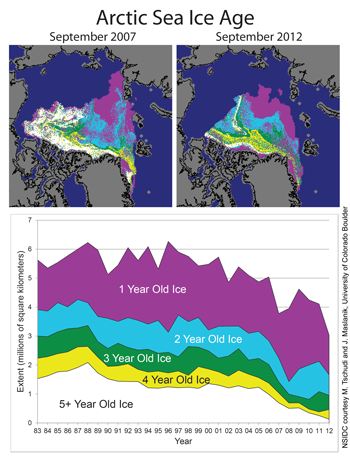 The Arctic cover now mainly consists of First year ice which tends to melt rapidly in summer.Newly developed estimates of sea-ice age, basin-scale sea-ice thickness, and sea-ice volume indicate thinning of the ice cover and loss of old ice types.